I have started and deleted this opening paragraph so many time now because I just don't know where to begin telling you about the awesome game I just finished twice. 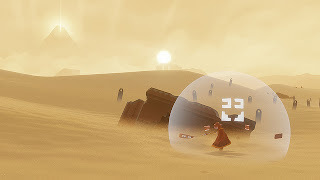 Last night I picked up Journey through PSN but didn't play it till this morning. 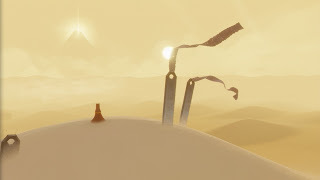 I have heard a lot about this game and being someone who is constantly looking for new and interesting experiences in terms of gaming, Journey felt like something I had to check out. There's a lot of hype and praise about the game scattered all over the gaming media. Some of it has even seeped into other news as a few critics have hailed the game as a true testament to "Games can be art." As far as I am concerned ... this game is for sure a piece of art. A very rich, lovingly crafted and surreal piece of art. I don't think I have ever been so taken back by a game. 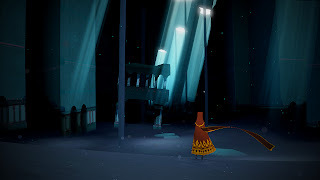 I feel like the happiest gamer ever because this year has already given me Demons Soul and Dark Souls which have become my favorite games of all time, and now I have Journey. Again I don't know what to say about it. Journey is amazing. The premise is so simple. You are a hooded traveler who awakes in a massive desert, in the distance you see a massive mountain with a beam of lighting leading from it straight into the sky. Now go to the mountain. This game is so well crafted that it doesn't need instructions or directions to play. You get a few control nods and then you're on your way. 5mins in and you feel like you've been waiting for this journey your whole life. You have a few skills at your disposal. Soon you come across these strange cloth creatures that grant you the ability to lift yourself. This is limited however but you can extend the uses over the course of the game. The second ability is to sing out a musical note. This can be a quick hum to a musical cheer. Using these lets you interact with the worlds puzzles and land marks. Though the game has a set path, the world of Journey is big enough to satisfy your curiosity if you wish to explore. Exploring opens up secret passages, power ups and other things that lets you learn more about the world you're in. The best part of Journey is when you meet up with other travelers. As you play along other gamers share the world with you. In fact on my first play through I met up with another player and we actually ended up finishing the game together. He or she showed me a few hidden areas and in my 2nd play through I got to lead other players to these as well. You can tell how many times a player has been through the game by how intricate the designs on their robe is. So people with a fresh robe are new to the game while others adorned with glamorous markings are familiar to the game as they have already finished it. The Journey also plays easier with a fellow traveler by your side. As his or her songs can get grant you power to keep a flight and move on faster through certain areas. When they come back for you when you lag behind is interesting because you wonder if they are really there for you or the power up. It's hard to tell you about my favorite parts of the game without spoiling the magic of it, as most of the magic comes from discovering things for yourself. There were a few moments that made me shout out loud with excitement and a lot of moments that simply took my breath away. For some reason the game really reminded me of the Avatar animated series. Not sure why though... maybe cause of the epicness of it. And the game is epic. It's hard to believe that something that handles so simple can get so grand. 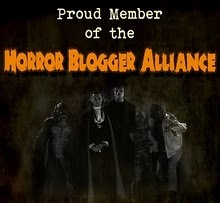 There's even a few scares in it too. When the game introduces a threat mechanic it gets a little unnerving because the game sets you up to feel very much at ease. But as your destination gets closer you have to prove that you deserve getting there. Sadly Journey isn't the longest game to play, I got through it in less than three hours. But the lasting appeal to go back and explore or help other travelers keeps the game fresh. Plus just the general feeling of the game kept me hooked. It's hard to believe a game with little to no combat, no form of communication and with such simple mechanics can be so engrossing. But it is... these are the kind of games that make you appreciate being a gamer and you should experience it for yourself if you get a chance. Dark Souls coming to pc?